If you like ghost and paranormal stories then you are going to like this one. I have published an ebook about ghostly and paranormal activities that have occurred in my own life. The book is called, “Real ghost and paranormal stories from India”. It contains real life ghost and paranormal stories, some of which are my very own while some of them have been told to me by others which I believe to be true. Everyone has ghost stories to tell and I decided to compile some of my best ones together in the form of a book. There are not many of these weird stories, only a handful, but enough to scare the hell out of anyone. 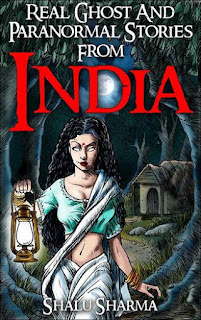 There are 7 stories altogether with an introduction of the types of ghosts believed to exist in India (more about types of ghosts in India here).